Start this new fall season off with our shades of gray! Begin with a conversational modern fit shirt featuring gray guitars underneath a great gray leather moto jacket. 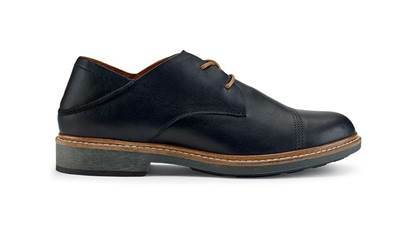 Add a pair of charcoal trim fitting 5 pocket pants and our premium hand-burnished leather lace-up oxfords. 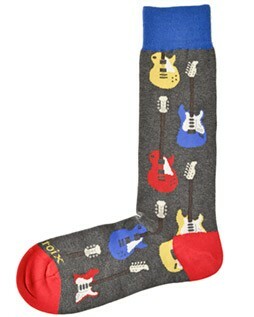 Complete this outfit with our tumbled bison leather belt and a fun pair of novelty socks featuring electric guitars. All of these add up to one great looking rock star! 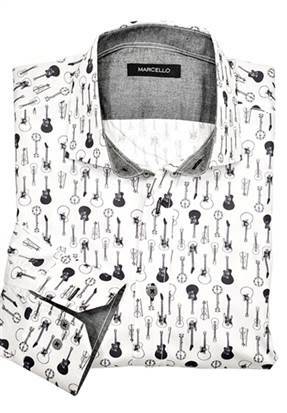 Choose your guitar with this unique conversational gray and black shirt from Marcello Sport! Soft cotton, subtle trim fabric and a classic shaped fit/modern fit. Machine washable. Available M, L, XL. Additional sizes available by special order. 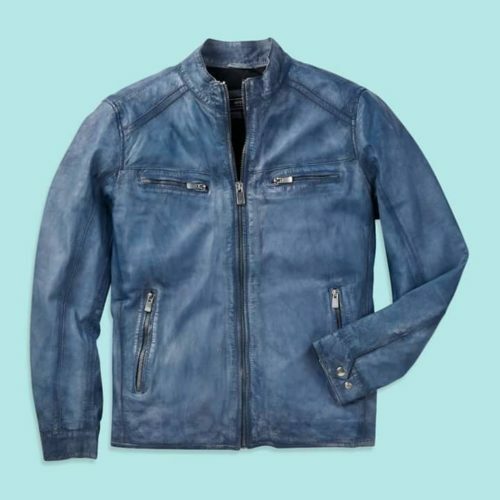 This luxe lamb gray leather moto jacket with one-of-a-kind details, featuring perforated overlaying. Full-zip front. Snap closure at banded collar and cuffs. Two zippered pockets, plus three interior pockets. Mesh front lining. Trim fit. 100% washed lamb. Available M, L, XL. Additional sizes available by special order. From Citizens of Humanity new PERFORM collection, this Gage fit, classic straight denim is made from performance focused, smart fabrics designed for durability and comfort. Crafted from specially engineered fabrics with technical properties ranging from power stretch, high recovery, moisture wicking, quick dry as well as antibacterial and temperature control. Lightweight with a soft texture, the 8 oz. comfort stretch twill brings ease to the overdyed fabric. Sulphur (shown). Other colors available on request. Available in sizes 32, 33, 34, 36 & 38. Other sizes available through special order. From Torino, this genuine American oiled shrunken bison black leather belt is full grain glove leather lined. 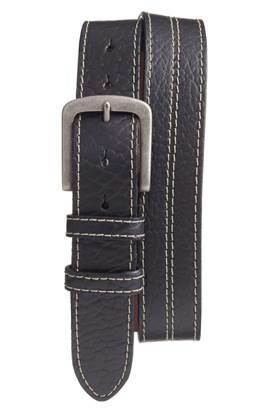 The contrasting gray saddle stitch and matte old nickel finish belt buckle add sophisticated finishes. Available in 32,34,36,38. Other sizes available by special order. From Olukai and teeming with authenticity, the Walino's premium leather and hand-burnished details are a statement in casual refinement. Available in black. Brown available on request. Available in 9, 9.5, 10.